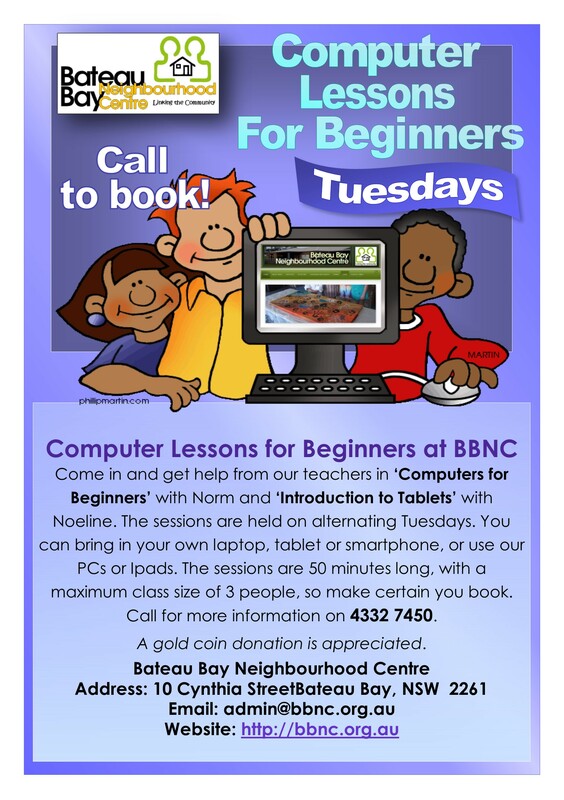 Come in on Tuesdays and get help from our teachers in ‘Computers for Beginners’ with Norm and ‘Introduction to Tablets’ with Noeline. 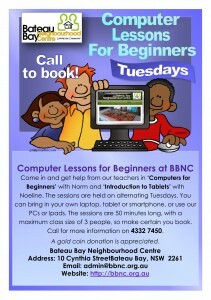 You can bring in your own laptop, tablet or smartphone, or use our PCs or Ipads. The sessions are 50 minutes long, with a maximum class size of 3 people, so make certain you book by calling us on 4332 7450. Good news! 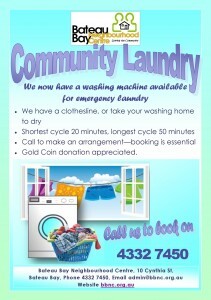 BBNC can now provide access to a washing machine and clothesline for a gold coin donation. 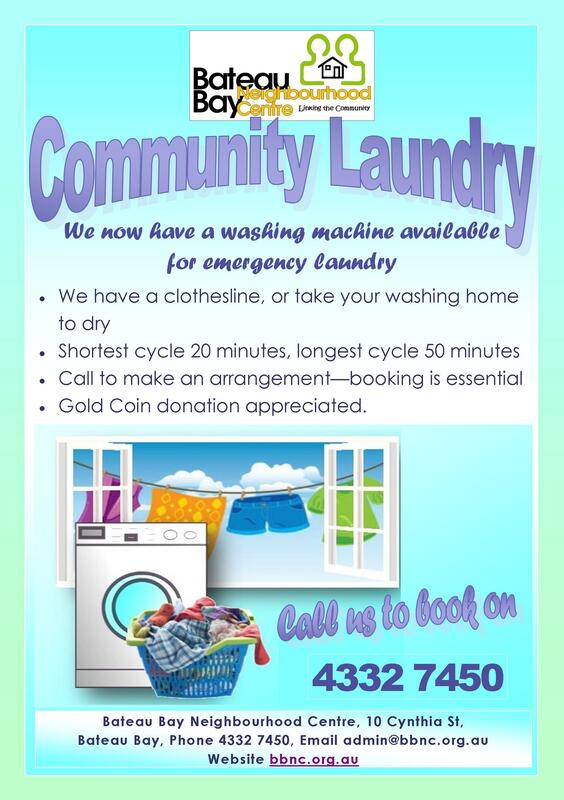 Booking is essential – if you need to use the laundry call us for an appointment on 4332 7450. 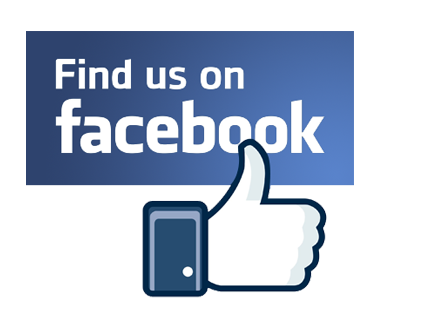 To view or download our A5/A4 flyer, click on the thumbnail at left. Former Bateau Bay NC volunteer and current Coordinator of BBNC Kate receives the Centres’ Registration Certificate from the Hon Ray Williams at BBNC. Former Bateau Bay NC volunteer Pete receives his Premiers Volunteer Recognition Award at BBNC. On Thursday 15 June, the Minister for Multiculturalism and Disability Services, the Hon Ray Williams, visited Bateau Bay Neighbourhood Centre to hear first-hand about the work volunteers are doing. 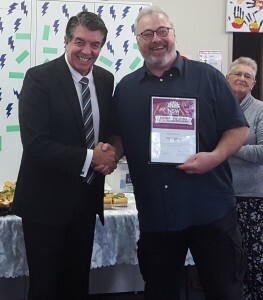 He presented Premiers Volunteer Recognition Program certificates to several volunteers and former volunteers, including long-serving volunteers from both Bateau Bay Neighbourhood Centre and our sister Centre, Berkeley Vale Neighbourhood Centre. Both Centres registered to adopt the Volunteering NSW Statement of Principles. 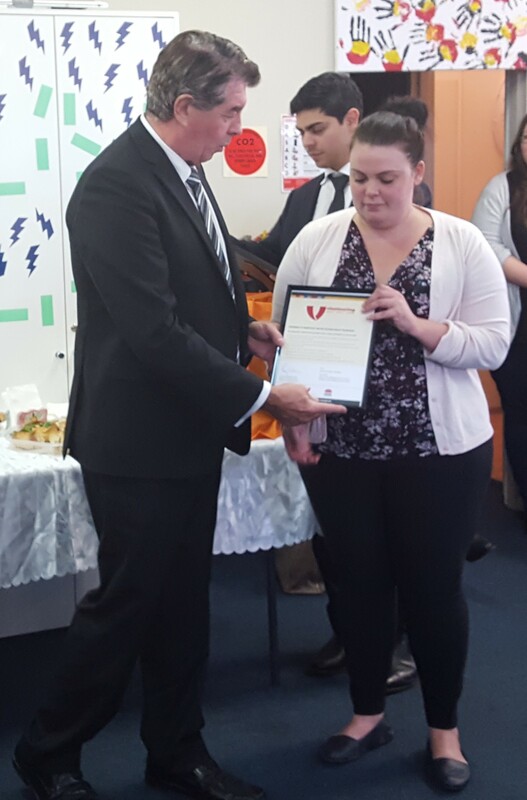 Photos of our Berkeley Vale NC volunteers receiving their awards can be found on their website at bvnc.org.au. 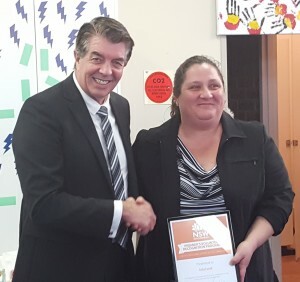 Bateau Bay NC volunteer Kelly receives her Premiers Volunteer Recognition Award at BBNC.